Bluetooth Sales & Installation in Kansas City, Stop by our Store today. Make and answer Calls without Looking at your Phone. Keep your eyes on the road! We sell both new car radios with built-in Bluetooth as well as adapters to add Bluetooth to your existing car radio. Most of our new car stereos from Alpine, Kenwood, Pioneer, JVC have built-in bluetooth for hands free cell phone use and streaming audio use (getting your music from your cell phone to play through your car stereo system). Getting the latest Bluetooth for your car radio is as simple as stopping by anytime. No appointment necessary. We have a large selection of car stereos and adapters with the latest aptX Bluetooth technology. aptX is an improvement in Bluetooth‘s music transfer quality so you can get near CD sound quality from your Bluetooth device. Many of todays’ new smartphones and car stereos have aptX built in. With aptX Bluetooth on your car stereo you can experience its benefits from many of todays improved phones and devices. 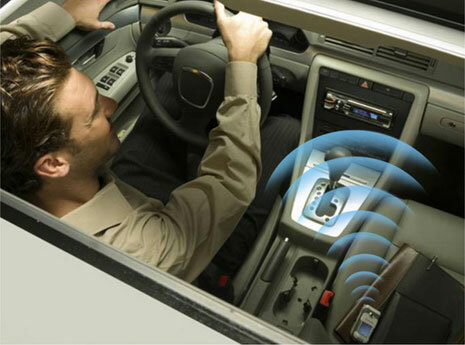 aptX is a patented technology that is being adopted by some car audio and phone manufacturers. Since Bluetooth is a short range wireless communications format that enables devices such as Bluetooth equipped cell phones and car stereos to talk with each other, the Bluetooth for your car radio will automatically see and recognize your phone. It can still be in your pocket or purse but when a call comes in, the phone ringer is heard in your car stereo speakers. You answer by pressing a button on the radio or Bluetooth adapter. You can hear the caller through the vehicle speakers. You talk normally and your voice is picked up by the small Bluetooth microphone mounted in the vehicle. You do not need to touch your phone. The caller i.d. information appears across the radio screen. You can make calls hands-free through voice recognition as long as your phone and radio supports this feature. Just say the name you want to call and your phone will automatically dial. Any music playing at the time in your car stereo will be temporarily muted so you can hear the caller through the car speakers and the caller can hear you just by your normal talking. Send your music to your car radio from your Smart Phone, cell phone or Mp3 player, so you can listen to your music in your car through your car speakers without connecting any cables! 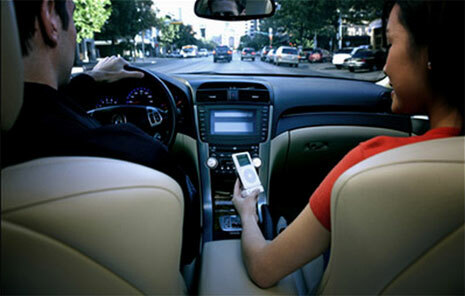 With Bluetooth for your car radio, your phone or Mp3 player is recognized automatically when you enter the vehicle. Your car radio will receive music from your phone just like playing a CD or listening to a radio station. We can demonstrate Bluetooth streaming audio in our store using your phone and one of the many Bluetooth car stereos we have on display. If you don’t have Bluetooth, you can get Bluetooth for your car radio by either purchasing an aftermarket Bluetooth adapter kit for your existing radio or you can replace your car radio with a new car stereo that has Bluetooth built in. You can then listen to your music on your car speakers without having to connect any cables between the radio and your music source. If you have Pandora Radio or similar services on your phone, you can stream this audio into your car stereo as well. Come Visit Our Store and Talk with a Real Car Radio & Bluetooth Expert! Remember, if you purchase Bluetooth for your car radio online it will have no local warranty. Since we are authorized dealers for the brands we sell, we give a local warranty and local product support when you buy from us, especially if we install your purchase.